Set oven rack about 6 inches from the heat source and preheat the oven’s broiler. Line a baking sheet with aluminum foil and rub with coconut oil. Stir mustard, vinegar, Sriracha sauce, and salt together in a bowl until glaze is smooth. Lay salmon fillets, skin-side down, on the prepared baking sheet. Brush fillets with mustard glaze. 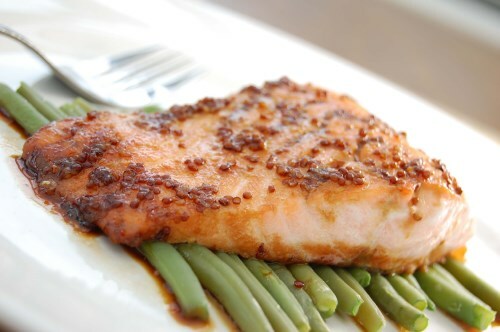 Cook in the preheated oven until salmon is golden and flakes easily with a fork, 5 to 8 minutes.